Downspout Installation in Sacramento – Call For Your Estimate Today! Downspouts by definition are drainage pipes that allow rainwater to travel away from the roof to an effective place on the ground to drain away from the property. Downspouts route rainwater away from a building's foundation. This is so that water doesn't pool around the building. If your downspouts are not functioning properly, rainwater flows off of the roof and can cause flooding and damage to your home or business. We provide downspout installation in Sacramento. Let our experienced downspout installation crew come out and give you an estimate on a downspout installation in Sacramento. Downspouts are made of sheet metal some companies use pre-made corners while others cut the actual downspout sticks to create the custom cuts by hand. Obviously, the second option requires far more experience to accomplish. Our installers are trained to provide Sacramento clients with a matching look of their existing downspouts. We don't cut corners, but we refuse to build a custom eyesore. Downspout installation Sacramento come in multiple shapes in sizes, round or rectangle. Through different size downspouts & designs. Not to mention the wide array of colors available for installation. Clients are able to match their current designs with ease simply by taking a photo & sending it to the installer prior to the appointment. This way they are completely prepared for any Sacramento Gutter Design. Installing downspouts in a gutter system is an obvious requirement. 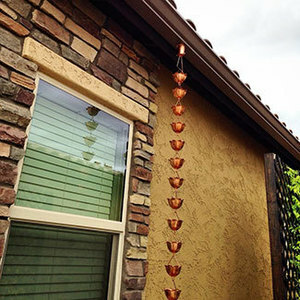 If you don't use a rain chain, you need a downspout. Otherwise, your gutters overfill with water & begin to damage your house. Many of our clients have gutters around the house with downspouts but their downspouts are sparse & far between. Leaving puddles of water in sections of their gutter, which leads to rust or other issues. Installing downspouts in Sacramento California is a standard for our company. Many clients need to improve the current drainage performance of their gutter system. Downspout installation Sacramento is a simple install of a single story or two story downspout to drain water from the gutter. 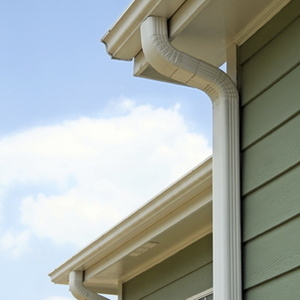 Downspouts are designed to remove water from the gutter and push the water away from the house. Which protects the house during the rain which happens throughout the year. Installing additional downspouts is a key way to prevent overflowing gutters and most Sacramento residents understand their importance. Why Monsters Gutter for Downspout Installations? After your downspout installation in Sacramento we always recommend regular inspections and maintenance to make sure that your gutters are not leaking and are draining at their peak performance. We are a family owned and operated company so you are sure to have a friendly experience. Much like when you are searching for any other contracting service when you are looking for a downspout installation in Sacramento you will want to make sure that you look for a licensed contractor. Anyone can go out there and say that they area pro at downspout installations, but if they aren't willing to go through the proper and legal steps it takes to become legally licensed bonded and insured. Then its probably safe to say that they are going to pay attention to the tiny details that's needed to provide quality downspout installations. Anyone is able to go on to the CSLB website to see if a contractor is licensed and as legitimate as they say they are. So go ahead check us out, look at our reviews and when you are ready for a downspout installation in Sacramento give us a call. We assure you that you will be glad that you did. Clean and functioning downspouts for your gutter system are vital to protecting your home from the rain that we experience. Clogged, damaged or leaky downspouts can cause several other problems and issues around your home as well such as water into a basement or foundation seepage. It can also cause siding damage and roof rot. Our downspout installation Sacramento crew is made up of highly qualified technicians that only use the best in quality downspouts to help protect one of your most important assets. We are a contractor that has been serving the Sacramento area for many years now. We pride ourselves on our attention to quality and detail. If you are looking for a downspout installation in Sacramento at an affordable price. Call Monster's Gutters for a estimate. Do your downspouts appear to be damaged, clogged or missing altogether? Monster's Gutter can repair and replace these downspouts in no time at all. We custom build them on-site to fit your homes specific needs. If you are having issues with flooding and foundation problems, your problem could be damaged downspouts or an overall drainage problem. We offer estimates for downspout installation in Sacramento as well as repairs. The best gutter system accompanied with clear and clean downspouts are of no use if the water is not draining away from your structure in the right places. We offer recommendations for every gutter or downspout installation estimate. This will ensure that you will never have problems with water erosion in your foundation. If your home is having problems related to drainage, call today. We are able to assess your current drainage situation to recommend several solutions, from repairs to downspout installation in Sacramento. If you are interested in a quality downspout installation in Sacramento at an affordable price, then you have come to the right place. 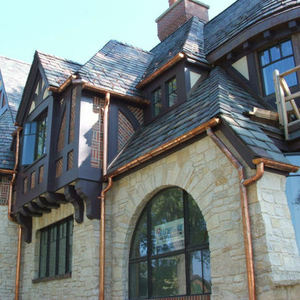 Monster's Gutter takes great pride in our work, 100% guaranteed. You can rest assured that we will provide quality service in a timely fashion. These downspouts offer a traditional look. With their flat, plain sides and sharp-angled elbows, the fit aesthetically with our two fascia styles of rain gutters. These downspouts are steel and are available in two sizes. And any variety of colors. These corrugated downspouts have parallel grooves and ridges. The bends are rounded and less likely to clog if you believe you will have a lot of debris that needs to drain through the downspouts. Corrugated downspouts are typically aluminum. These round downspouts offer a very distinctive look. Made of steel and come in a standard sized of 3-inches round. At Monster's Gutters in Sacramento we provide complete downspout installations in Sacramento for both commercial and residential clients. We use only quality materials. Our main focus is to make sure that you are 100% satisfied with every interaction with us. No downspout installation in Sacramento is too small or big for us to handle. A new downspout installation will better help to make sure that rainwater properly drains away from your home or business. Our technicians will go over the placement of your downspout so that they are in the prime places to properly drain water away from your home and foundation.